This article is about the New Zealand politician. For other uses, see Peter Fraser (disambiguation). Peter Fraser CH PC (/ˈfreɪzər/; 28 August 1884 – 12 December 1950) was a New Zealand politician who served as the 24th Prime Minister of New Zealand from 27 March 1940 until 13 December 1949. Considered a major figure in the history of the New Zealand Labour Party, he was in office longer than any other Labour prime minister, and is to date New Zealand's fourth-longest-serving head of government. Born and raised in the Scottish Highlands, Fraser left education early in order to support his family. While working in London in 1908, Fraser joined the Independent Labour Party, but unemployment led him to emigrate to New Zealand in 1910. On arrival in Auckland, he gained employment as a stevedore and became involved in union politics upon joining the New Zealand Socialist Party. In 1916, Fraser was involved in the foundation of the unified Labour Party. He spent one year in jail for sedition after speaking out against conscription during the First World War. In 1918, Fraser won a Wellington by-election and entered the House of Representatives. Fraser became a cabinet minister in 1935, serving under Michael Joseph Savage. He held several portfolios and had a particular interest in education, which he considered vital for social reform. 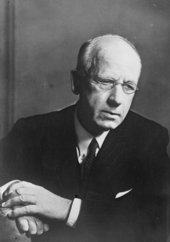 As Minister of Health, he introduced the Social Security Act 1938, which established a universal health care service. Fraser became the Leader of the Labour Party and Prime Minister in 1940, following Savage's death in office. Fraser is best known for leading the country during the Second World War when he mobilised New Zealand supplies and volunteers to support Britain while boosting the economy and maintaining home front morale. He formed a war cabinet which included several erstwhile political opponents. Labour suffered significant losses in the 1943, though the party retained its majority. Following the war, Fraser was active in the affairs of the 'new' Commonwealth and is credited with increasing New Zealand's international stature. Fraser led his party to its fourth successive election victory in 1946, albeit with a further reduced majority. The after-effects of the war, including ongoing shortages, were affecting his government's popularity. Labour lost the 1949 election and Fraser's government was succeeded by the first National Party government. A native of Scotland, Peter Fraser was born in Hill of Fearn, a small village near the town of Tain in the Highland area of Easter Ross. He received a basic education, but had to leave school due to his family's poor financial state. Though apprenticed to a carpenter, he eventually abandoned this trade due to extremely poor eyesight – later in life, faced with difficulty reading official documents, he would insist on spoken reports rather than written ones. Before the deterioration of his vision, however, he read extensively – with socialist activists such as Keir Hardie and Robert Blatchford among his favourites. Becoming politically active in his early teens, he was 16 years old upon attaining the post of secretary of the local Liberal Association, and, eight years later, in 1908, joined the Independent Labour Party. In another two years, at the age of 26, after unsuccessfully seeking employment in London, Fraser decided to move to New Zealand, having apparently chosen the country in the belief that it possessed a strong progressive spirit. He gained employment as a stevedore on arrival in Auckland, and became involved in union politics upon joining the New Zealand Socialist Party. Fraser worked as campaign manager for Michael Joseph Savage as the Socialist candidate for Auckland Central electorate. He was also involved in the New Zealand Federation of Labour, which he represented at Waihi during the Waihi miners' strike of 1912. He moved to Wellington, the country's capital shortly afterwards. Savage went on to be Fraser's predecessor in office as the nation's first Labour Prime Minister. In 1913, he participated in the founding of the Social Democratic Party and, during the year, within the scope of his union activities, found himself under arrest for breaches of the peace. While the arrest led to no serious repercussions, it did prompt a change of strategy – he moved away from direct action and began to promote a parliamentary route to power. Upon Britain's entry into the First World War, he strongly opposed New Zealand participation since, sharing the belief of many leftist thinkers, Fraser considered the conflict an "imperialist war", fought for reasons of national interest rather than of principle. In 1916, Fraser became involved in the foundation of the New Zealand Labour Party, which absorbed much of the moribund Social Democratic Party's membership. The members selected Harry Holland as the Labour Party's leader. Michael Joseph Savage, Fraser's old ally from the New Zealand Socialist Party, also participated. 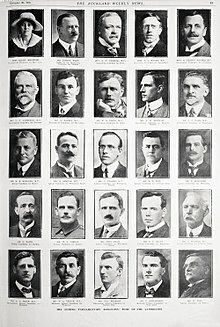 Later in 1916, the government had Fraser and several other members of the new Labour Party arrested on charges of sedition. This resulted from their outspoken opposition to the war, and particularly their call to abolish conscription. Fraser received a sentence of one year in jail. He always rejected the verdict, claiming he would only have committed subversion had he taken active steps to undermine conscription, rather than merely voicing his disapproval. After his release from prison, Fraser worked as a journalist for the official Labour Party newspaper. He also resumed his activities within the Labour Party, initially in the role of campaign manager for Harry Holland. In 1919 Fraser stood on the Labour Party's ticket for the Wellington City Council. He and three others were first Labour candidates to win office on the council since before the war. Fraser led a movement on the council to establish a municipal milk distribution department in Wellington, which was to remain in operation until the 1990s. He was re-elected in 1921, though Labour lost ground only winning two seats. In 1923 Fraser stood for Mayor of Wellington. He adopted an "all or nothing" strategy by standing only for the mayoralty, refusing nomination to stand for the council also. Fraser polled higher than any Labour mayoral candidate in New Zealand history but lost by only 273 votes to Robert Alexander Wright in the closest result Wellington had ever seen. Fraser made a comeback on the council when he was persuaded to stand in a 1933 by-election. Wright was his main opponent and was victorious in a heavy polling contest which was dubbed by the media as a "grudge match" repeat of 1923. Fraser was re-elected to the Council in 1935, topping the poll with more votes than any other candidate. The next year he decided to resign from the council in order to focus on his ministerial duties. 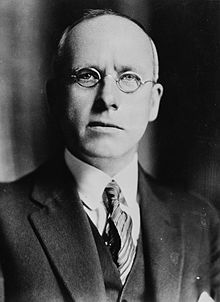 A by-election was avoided when Andrew Parlane, the highest polling unsuccessful candidate from 1935, was acclaimed to fill Fraser's seat. In a 1918 by-election, Fraser gained election to Parliament, winning the electorate of Wellington Central. 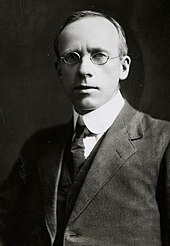 He soon distinguished himself through his work to counter the influenza epidemic of 1918–19, of which Fraser was himself a survivor. During his early years in parliament, Fraser developed a clearer sense of his political beliefs. Although initially enthusiastic about the Russian October Revolution of 1917 and its Bolshevik leaders, he rejected them soon afterwards, and eventually became one of the strongest advocates of excluding communists from the Labour Party. His commitment to parliamentary politics rather than to direct action became firmer, and he had a moderating influence on many Labour Party policies. Fraser's views clashed considerably with those of Harry Holland, still serving as leader, but the party gradually shifted its policies away from the more extreme left of the spectrum. Fraser soon became convinced that political action via parliamentary process was the only realistic course of action to achieve Labour movement ambitions. As a result, he accepted the inevitable compromises (which Holland did not) that the attainment of parliamentary success required. In 1933, however, Holland died, leaving the leadership vacant. Fraser considered contesting it, but eventually endorsed Michael Joseph Savage, Holland's more moderate deputy. Fraser became the new deputy leader. While Savage represented perhaps less moderate views than Fraser, he lacked the extreme ideology of Holland. With Labour now possessing a "softer" image and the existing conservative coalition struggling with the effects of the Great Depression, Savage's party succeeded in winning the 1935 election and forming a government. Fraser served as vice-president of the Labour Party in 1919–1920, and as party president in 1920–1921. In the new administration, Fraser became the Minister of External Affairs, the Minister of Island Territories, Minister of Health, Minister of Education, Minister of Marine, and Minister of Police. He showed himself extremely active as a minister, often working seventeen hours a day, seven days a week. During his first years in cabinet, his wife, Janet, had an office next to his and worked as his research assistant and adviser in order that she could spend time with him. She would also prepare meals for him during his long days at parliament. He had a particular interest in education, which he considered vital for social reform. His appointment of C.E. Beeby to the Education Department provided him with a valuable ally for these reforms. Fraser held a passionate belief that education had a huge part to play in the social reform he desired. As Minister of Health, Fraser also became the driving force behind the 1938 Social Security Act. The Act proposed a comprehensive health care system, free at the point of use; it faced strong opposition, particularly from the New Zealand branch of the British Medical Association. Eventually, Fraser negotiated effectively enough to force the Association to yield. Fortunately for him, Janet Fraser had long volunteered in the health and welfare fields and was an invaluable adviser and collaborator. 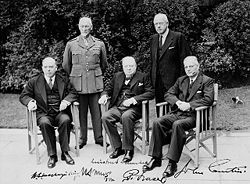 When the Second World War broke out in 1939, Fraser had already taken over most of the functions of national leadership. Michael Joseph Savage had been ill for some time and was near death, although the authorities concealed this from the public. Fraser had to assume most of the Prime Minister's duties in addition to his own ministerial ones. Internal disputes within the Labour Party made Fraser's position more difficult. John A. Lee, a notable socialist within the Party, vehemently disapproved of the party's perceived drift towards the political centre, and strongly criticised Savage and Fraser. Lee's attacks, however, became strong enough that even many of his supporters denounced them. Fraser and his allies successfully moved to expel Lee from the Party on 25 March 1940. Savage died two days later, on 27 March, and Fraser successfully contested the leadership against Gervan McMillan and Clyde Carr. He had, however, to give the party's caucus the right to elect people to Cabinet without the Prime Minister's approval – a practice which has continued as a feature of the Labour Party today[update]. Despite the concession, Fraser remained in command, occasionally alienating colleagues due to a governing style described by some as "authoritarian". Some of his determination to exercise control may have come about due to the war, on which Fraser focused almost exclusively. Nevertheless, certain measures he implemented, such as censorship, wage controls, and conscription, proved unpopular with the party. In particular, conscription provoked strong opposition, especially since Fraser himself had opposed it during the First World War. Fraser replied that fighting in the Second World War, unlike in the First World War, had indeed a worthy cause, making conscription a necessary evil. Despite opposition from within the Labour Party, enough of the general public supported conscription to allow its acceptance. 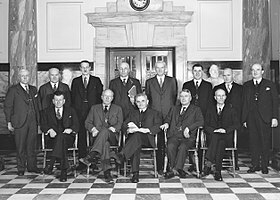 Group portrait photograph taken at a gathering of Cabinet ministers in 1941. Fraser is standing in the centre. Former prime minister and dissident National MP Gordon Coates stands furthest right. Fraser was one of the immediate few in New Zealand who instantly grasped that war meant not merely the involvement of the military, but that of the whole country. These implications were not always recognised either by his own party or by the opposition. Fraser further developed somewhat of an authoritarian streak as a result; this reflected his insistence on the overwhelming importance of the war effort above all else. During the war, Fraser attempted to build support for an understanding between Labour and its main rival, the National Party. However, opposition within both parties prevented reaching an agreement, and Labour continued to govern alone. Fraser did, however, work closely with Gordon Coates, a former Prime Minister and now a National-Party rebel – Fraser praised Coates for his willingness to set aside his party loyalty, and appears to have believed that National leader Sidney Holland placed the interests of his party before national unity. In terms of the war effort itself, Fraser had a particular concern with ensuring that New Zealand retained control over its own forces. He believed that the more populous countries, particularly Britain, viewed New Zealand's military as a mere extension of their own, rather than as the armed forces of a sovereign nation. After particularly serious New Zealand losses in the Greek campaign in 1941, Fraser determined to retain a say as to where to deploy New Zealand troops. Fraser insisted to British leaders that Bernard Freyberg, commander of the 2nd New Zealand Expeditionary Force, should report to the New Zealand government just as extensively as to the British authorities. When Japan entered the war, Fraser had to choose between recalling New Zealand's forces to the Pacific (as Australia had done) or keeping them in the Middle East (as Winston Churchill requested). Opinion was divided on the question and New Zealand's manpower resources were already stretched to capacity. Fraser received assurances from Franklin Roosevelt that American forces would be made available for New Zealand's defense, the local populace possessed an understandable view that division that their proper place was defending their homes. Fraser weighed up public opinions against the strategic arguments involved and eventually opted to leave New Zealand's Expeditionary Force where it was. In a remarkable display of political acumen and skill, he then persuaded a divided government and Parliament to give their full support [to leave the army in Africa]. It was leadership of the highest order. Fraser had a very rocky relationship with U.S. Secretary of State Cordell Hull, particularly over the Canberra Pact in January 1944. Hull gave Fraser a sharp and rather demeaning dressing-down when Fraser visited Washington D.C. in mid-1944, which resulted in New Zealand's military becoming sidelined to some extent in the conduct of the Pacific War. In 1943 Fraser arranged for 6,000 men to return home from the Mediterranean theatre for a three-month 'furlough' (period of military leave), anticipating that the grateful men and their families would be more disposed to vote Labour in the general election. Upon arrival, however, many of the veterans were furious at the numbers in reserved occupations, some of whom were making menial goods of no use to the war effort. Moreover, unions had ensured that bonuses and high pay were awarded to munitions workers, far in excess of the money paid to the men in combat. 'No man twice before every man first' became one of the returning soldiers' mantras, and several thousand of them secured exemption from further service due to age, being married, or being Maori. A number of the remainder were court martialed, sentenced to 90 days' imprisonment, and forced to return (though some had deserted and were not able to be found. Further, they were denied a military pension and refused government jobs. Due to censorship the public heard little of the protests and the affair, known as the 'Furlough Mutiny', was omitted from post-war history books for many years. Fraser's government also established a far closer working understanding with the Labor government in Australia. 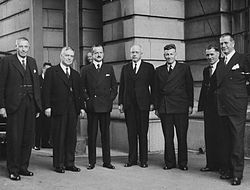 He signed the Australian–New Zealand Agreement of 1944, in which Fraser, under pressure by Australia’s foreign minister, H. V. Evatt, overplayed his hand seeking to ensure that both Australian and New Zealand interests in the Pacific would not be overlooked in the war or its aftermath. New Zealand and Australia were both anxious to have their input in the planning of the Pacific war, and later in the decisions of the "Great Powers" in the shaping of the post-war world. After the war ended, Fraser devoted much attention to the formation of the United Nations at the San Francisco conference (UNCIO) in 1945; this "was the apogee of Fraser's career". Noteworthy for his strong opposition to vesting powers of veto in permanent members of the United Nations Security Council, he often spoke unofficially for smaller states. He was elected chairman of one of the main committees which was considering dependent territories, and next year in London was chairman of one of the social-economic committees at the first assembly in London. He earned the respect of many world statesmen through his commitment to principle, his energy, and most of all his skill as a chairman. It was to Fraser's stature that New Zealand would later owe much of its favourable international reputation. Fraser had a particularly close working relationship with Alister McIntosh, the head of the Prime Minister's department during most of Fraser's premiership and then of the Department of External Affairs, created in 1946. McIntosh privately described his frustration with Fraser's workaholism, and with Fraser's insensitivity towards officials' needs for private lives; but the two men had a genuinely affectionate relationship. Fraser also took up the role of Minister of Native Affairs (which he renamed Māori Affairs) in 1947. Fraser had had an interest in Māori concerns for some time, and he implemented a number of measures designed to reduce inequality. The Maori Social and Economic Advancement Act, which he introduced in 1945, allowed Māori involvement and control over welfare programmes and other assistance. A statue of Fraser in the Government Buildings Historic Reserve in Wellington. Fraser's Government had proposed to adopt the Statute of Westminster 1931 in its Speech from the Throne in 1944 (two years after Australia adopted the Act), in order to gain greater constitutional independence. During the Address-In-Reply debate, the opposition passionately opposed the proposed adoption, claiming the Government was being disloyal to the United Kingdom. National MP for Tauranga, Frederick Doidge, argued "With us, loyalty is an instinct as deep as religion". The proposal was buried. Ironically, the National opposition prompted the adoption of the Statute in 1947 when its leader and future Prime Minister Sidney Holland introduced a private members' bill to abolish the New Zealand Legislative Council. Because New Zealand required the consent of the Parliament of the United Kingdom to amend the New Zealand Constitution Act 1852, Fraser decided to adopt the Statute. The adoption of the Statute of Westminster was soon followed by the debate on the future of the British Commonwealth in its transformation into the Commonwealth of Nations. In April 1949 Ireland, formerly the Irish Free State, declared itself a republic and ceased to be a member of the Commonwealth. Fraser's government reacted by passing the Republic of Ireland Act 1949, which treated Ireland as if it were still a member of the Commonwealth. Meanwhile, newly independent India would have to leave the Commonwealth on becoming a republic also, although it was the Indian Prime Minister's view that India should remain a member of the Commonwealth as a republic. Fraser believed that the Commonwealth could as a group address the evils of colonialism and maintain the solidarity of common defence. I have the greatest desire to see India retained in the Commonwealth, but for the moment, I see no satisfactory means of bringing this about. Are the members of the Commonwealth who do wish to retain the Crown to end up with a form of words covering an arrangement which is entirely nebulous? Are we justified in releasing India from the obligations which the rest of us willingly assume without any reasonable accommodation on the part of India in return? New Zealand had been colonized by people of British stock, who had built their new country as an extension of the homeland; and their sentiments of loyalty and affection towards the Royal Family had intensified with the passage of time. Throughout the successive stages by which they had attained full national independence their loyalty and allegiance had grown progressively stronger. New Zealand would not tolerate any dilution of those loyalties. The conference quashed a proposal of a two-tier structure that would have had the traditional Commonwealth realms, perhaps with defence pacts, on one tier, and the new members which opted for a republic, on the second tier. The final compromise is perhaps best seen from the title finally accepted for the King, as Head of the Commonwealth. Fraser argued that the compromise allowed the Commonwealth dynamism, that would in the future allow former colonies of Africa to join as republics and be stalwarts of this New Commonwealth. It also allowed New Zealand the freedom to maintain its individual status of loyalty to the Crown and to pursue collective defence. Indeed, Fraser cabled a senior minister, Walter Nash, after the decision was taken to accept India that "while the Declaration is not as I would have wished, it is on the whole acceptable and maximum possible, and does not at any rate leave our position unimpaired". Although he relinquished the role of Minister of Education early in his term as Prime Minister, he and Walter Nash continued to have an active role in developing educational policy with C. E. Beeby. Labour's majority at the 1946 election was reduced to one seat. The after-effects of the war were affecting his government's popularity. Fraser moved to the Wellington seat of Brooklyn, which he held until his death. From 1940 to 1949 Fraser lived in a house "Hill Haven" at 64-66 Harbour View Road, Northland, Wellington, which had been purchased for the use of the then-ill Savage in 1939. Fraser's domestic policies came under criticism. His slow speed in removing war-time rationing and his support for compulsory military training during peacetime in the 1949 referendum particularly damaged him politically. Some thought this hypocritical compared to Fraser's earlier sentiments on the subject. Much earlier in his career, in 1927 he is noted to have said that compulsory military training was "out of date, inefficient and not worth the money spent on it". With dwindling support from traditional Labour voters, and a population weary of war-time measures, Fraser's popularity declined. At this stage of his career, Fraser relied heavily on the party "machine". As a result, the gap between the party leadership and rank and file members widened to the point where Labour's political enthusiasm dwindled. In the 1949 election the National Party defeated his government. Fraser became Leader of the Opposition, but declining health prevented him from playing a significant role. He died in Wellington at the age of 66 and was buried in the city's Karori cemetery. His successor as leader of the Labour Party was Walter Nash. His successor in the Brooklyn electorate, elected in the Brooklyn by-election, 1951, was Arnold Nordmeyer. On 1 November 1919, a year after his election to parliament, Fraser married Janet Kemp née Munro, from Glasgow and also a political activist. They remained together until Janet's death in 1945, five years before Fraser's own passing. During Fraser's time as Prime Minister, Janet traveled with him and acted as a "political adviser, researcher, gatekeeper and personal support system". Her ideas influenced his political philosophy. The couple had no children, although Janet had a son from her first marriage to George Kemp. Fraser died on 12 December 1950 from a heart attack following hospitalisation with influenza. His body lay in state in the New Zealand Parliament Buildings for three days and a state funeral service was conducted by the Moderator of the Presbyterian Church. In 1935, Fraser was awarded the King George V Silver Jubilee Medal, and in 1937, he was awarded the King George VI Coronation Medal. He was appointed a Privy Counsellor in 1940 and a Member of the Order of the Companions of Honour in 1946. Fraser was portrayed in the 2011 New Zealand TV movie, Spies and Lies. Fraser was portrayed by the New Zealand actor Peter Hambleton, without a Scottish accent. ^ a b c d e f g h i j k Beaglehole, Tim. "Fraser, Peter". Dictionary of New Zealand Biography. Ministry for Culture and Heritage. Retrieved 11 December 2011. ^ Peter Fraser. Encyclopædia Britannica. Retrieved on 24 December 2017. ^ "Peter Fraser, seditious utterances | NZHistory, New Zealand history online". Ministry for Culture and Heritage. Retrieved 22 December 2017. ^ Bassett 2000, pp. 89. ^ Bassett 2000, pp. 106. ^ "Wellington City Council". The Evening Post. CV (107). 7 May 1923. p. 2. Retrieved 16 June 2016. ^ "The Mayoralty". The Evening Post. CV (99). 27 April 1923. p. 4. Retrieved 16 June 2016. ^ "Labour Win". Auckland Star. LXIV (152). 30 June 1933. p. 12. Retrieved 22 May 2017. ^ Bassett 2000, pp. 128. ^ "Polling in Wellington". The New Zealand Herald. LXXII (22105). 10 May 1935. p. 13. Retrieved 2 August 2016. ^ "No by-election". The Evening Post. CXXI (109). 9 May 1936. p. 10. Retrieved 29 June 2018. ^ Scholefield 1950, p. 107. ^ a b c d e Brown 1966. ^ Gustafson 1980, p. 156. ^ New Zealand Parliamentary Debates, Vols. 263-288 (1943-1949). ^ Bryder, Linda; Stewart, J. (2015). "'Some Abstract Socialistic Ideal or Principle': British Reactions to New Zealand's 1938 Social Security Act". Britain and the World. 8: 51–75. doi:10.3366/brw.2015.0167. hdl:2292/25880. ^ Thorn, James (1952). Peter Fraser: New Zealand's Wartime Prime Minister. Odhams Press. Retrieved 2 January 2018. ^ Bassett 2000, pp. 296. ^ a b McLean, Gavin. "Peter Fraser". nzhistory.govt.nz. Ministry for Culture and Heritage. Retrieved 2 January 2018. ^ Cited in Jim Bolger (16 March 1994). Speech to the Annual Conference of the Newspaper Publishers Association. Newspaper Publishers Association. ^ "New Zealand Parliament - New Zealand sovereignty: 1857, 1907, 1947, or 1987?". ^ a b c d e Harshan Kumarasingham. "The 'New Commonwealth' 1947 - 49: A New Zealand perspective on India joining the Commonwealth". Victoria University of Wellington. Retrieved 7 July 2010. ^ Norton, Clifford (1988). New Zealand Parliamentary Election Results 1946-1987: Occasional Publications No 1, Department of Political Science. Wellington: Victoria University of Wellington. p. 203. ISBN 978-0-475-11200-2. ^ a b "Mr. Peter Fraser Dead; Wartime N.Z. Leader". The West Australian. 66 (20, 095). 13 December 1950. p. 2. Retrieved 10 September 2013. ^ Ewan, Elizabeth; Innes, Sue; Reynolds, Sian, eds. (2006). The Biographical Dictionary of Scottish Women: From the Earliest Times to 2004. Edinburg: Edinburgh University Press. p. 128. ISBN 978-0748617135. ^ "Official jubilee medals". The Evening Post. 6 May 1935. p. 4. Retrieved 2 July 2013. ^ Taylor, Alister (1998). The New Zealand Roll of Honour. Alister Taylor. p. 399. ISBN 978-0-908578-58-0. Bassett, Michael; King, Michael (2000). Tomorrow Comes the Song: A Life of Peter Fraser. Auckland: Penguin. ISBN 978-0-14-029793-5. Brown, Bruce (1966). "FRASER, Right Hon. Peter, P.C., C.H.". In McLintock, A. H. (ed.). An Encyclopaedia of New Zealand. Ministry for Culture and Heritage / Te Manatū Taonga. Retrieved 21 April 2016. Gustafson, Barry (1986). The First 50 Years : A History of the New Zealand National Party. Auckland: Reed Methuen. ISBN 978-0-474-00177-2. Wikimedia Commons has media related to Peter Fraser.